Circa 1908. This handicapped-accessible three-story brick Edwardian with Queen Anne wraparound veranda boasts a mosaic-tiled porch floor. Inside are inlaid mahogany and rosewood floors, bay windows and a turret that starts in the parlor and ascends to the second-floor Holly Marie Room, decorated in a wedding motif. 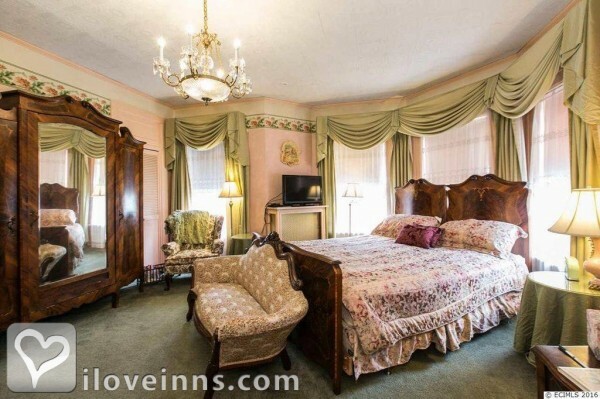 This room features a seven-piece Rosewood bedroom suite and a crystal chandelier. 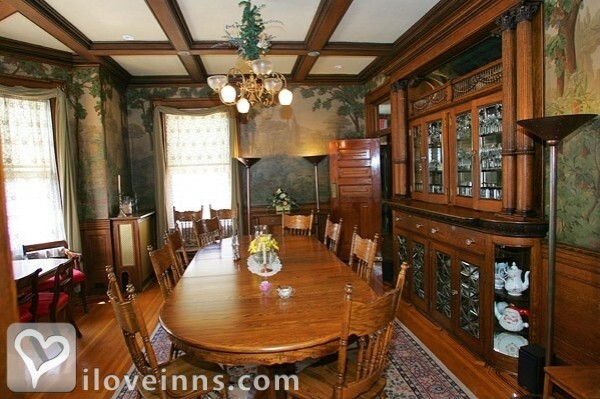 A gourmet breakfast is served in the dining room with a fantasy forest mural from the turn of the century. There is an herb garden outside the kitchen. Located just 12 blocks away, is the fabulous National Mississippi River Museum and Aquarium. 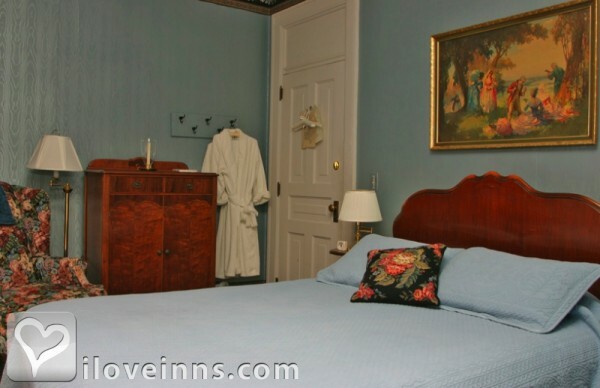 The inn can equally accommodate both business and pleasure travel. Payment Types Accepted Include Visa, Personal Checks, Master Card, Discover, American Express and Travelers Checks. This property has 8 total guest accommodations, 6 with private bath, 1 with fireplace, 1 two-bedroom suite and 2 conference rooms. The types of beds available include Twin, Queen and King. 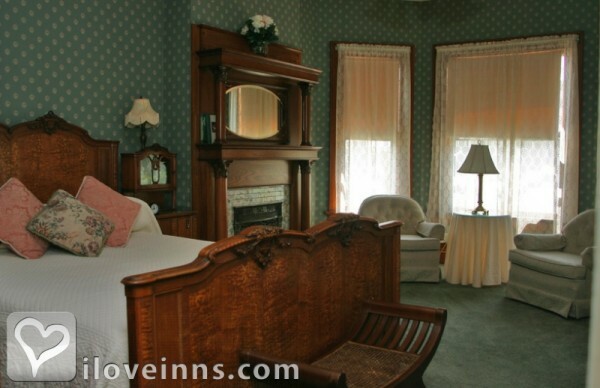 The Inn is beautifully restored, has lovely furnishings and a tranquility that soothes the soul and inspires intimacy. Lovely english cottage gardens - with a pond and handicap bridge and ramp through the side garden, over the pond and into the house. 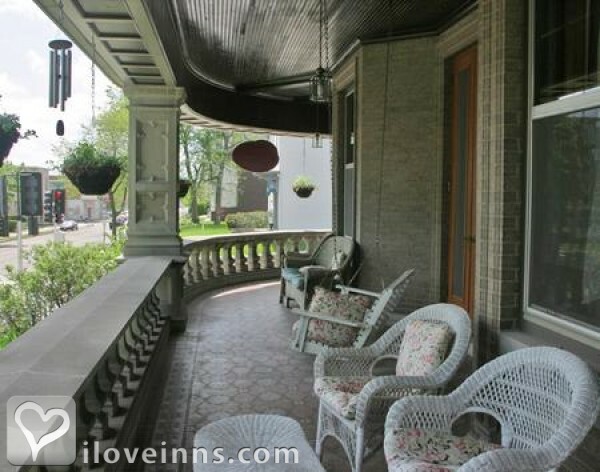 The primary entrance into the Inn is a gorgeous double stair case and queen anne wrap-around porch with wicker furniture and italian tile floor - overlooks front garden. The home was the private home of Nicholas Schrup, senator and financier (owned all banks and insurance companies in the city) at the turn of the 19th and early 20th centuries. The mansion was designed and built by the renowned Swiss architect Fridolin Heer. 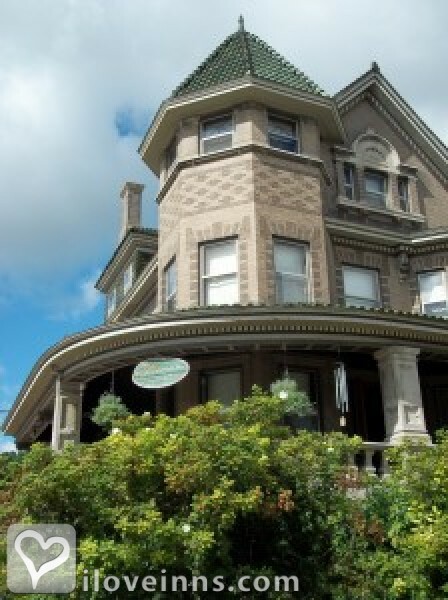 Some exceptional aspects of the mansion include a hand-carved Queen Anne wrap-around veranda, distinctive green spanish clay tile roof, hexagonal turret, eclectic patterened brickwork, Palladian windows in the east gable and a unique leaded and stained glass window of Saint Cecelia (patron Saint of musicians) holding a mandolin. The dates this property will honor the certificate are Sunday-Thursday, no holidays. Beautiful and tasty quiche dish. Perfect for breakfast, brunch or dinner. Great with fresh fruit and sausage for breakfast; just as wonderful for lunch or dinner with a mixed field green salad and crusty bread. Scrumptious mushroom quiche that will melt in your mouth. Mouth watering blend of Sour Dough flavor and carmelization make this special french toast an absolute delight. 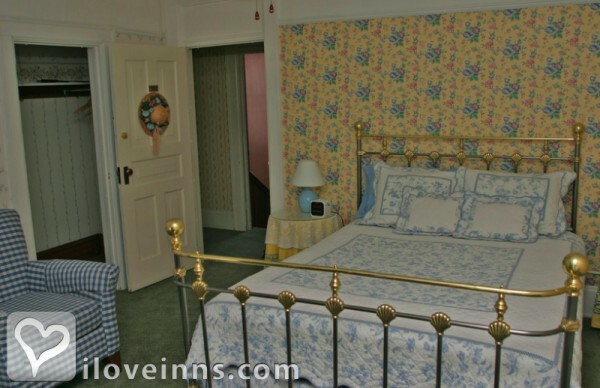 We have absolutely enjoyed being your guests here at the Inn. This was the perfect Honeymoon for us and we couldn't have dreamed of a better stay. Our room was beautiful and your company at breakfast delightful! We look forward to our next stay here + seeing you again. God Bless! Our first B&B experience - Wow!! 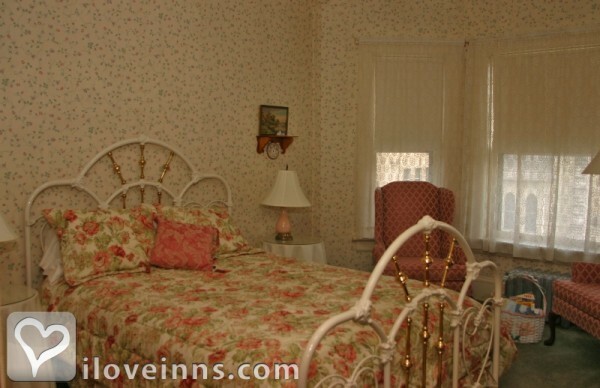 The Mandolin Inn is our first B&B experience. Wow@ What an impressive combination of art, architecture and hospitality! 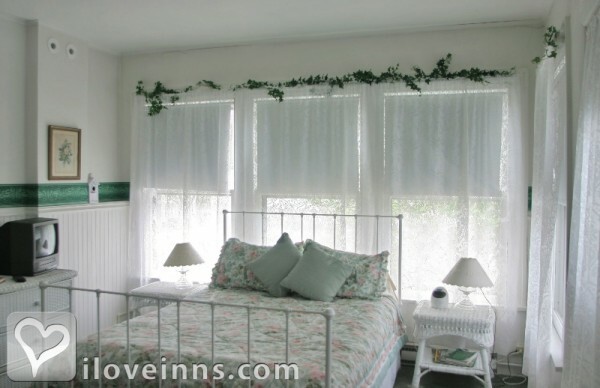 The Amanda room is a serene retreat, very homey and we love the decor. The mansion is beautiful: the woodwork; the leaded/stained glass; ththe antiqie furnishings; the verandah. 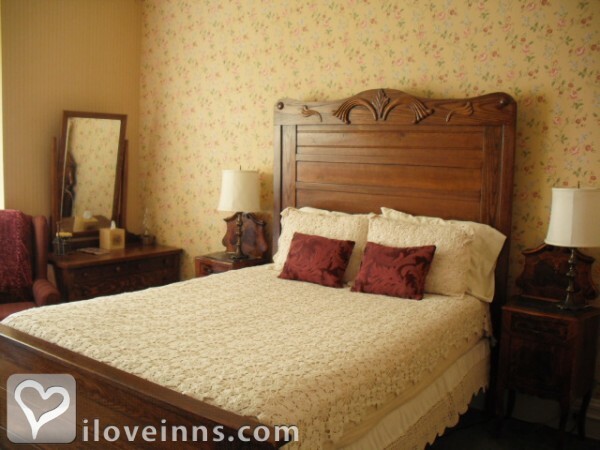 The Mandolin Inn is a true gem. 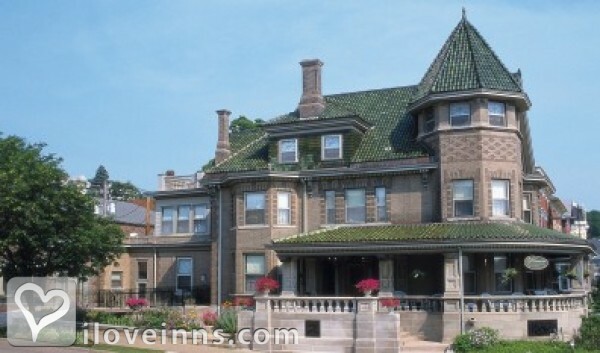 The location is great - conveniently within walking distanve from most attractions in downtown Dubuque. We came to celebrate our 13th anniversary. Amy is a gracious hostess and makes you feel welcome. The breakfasts are delicious. Cinderella and Mokie (kitties) are so cute and friendly. 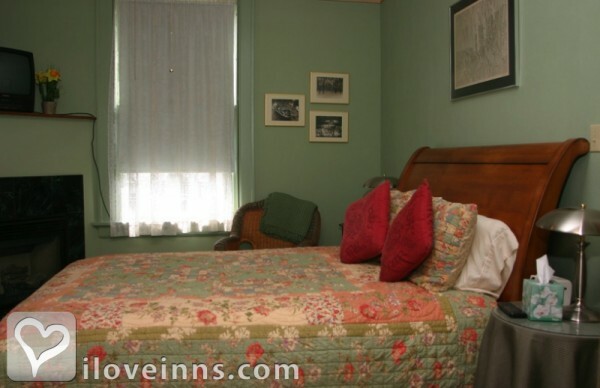 We would definately recommend the Mandolin Inn and look forward to a return trip. We really loved it here! Amy you're great. You have such a beautiful home, We loved our stay with you. The room is so comfortable. I will tell my friends what a wonderful hostess you are - This was my first experience at a B&B and I must say the home made me feel nostalgic - Thank you so much for making our stay so memorable. From the moment we entered the Mandolin, we felt at home. I know we'll be back. USA Today's "10 Best" Places to Stay, Arrington's BNB Journal, 2006 Summer Inn Traveler magazine, Iowan Magazine, Dubuque, Des Moines and Chicago newspapers, Emerging Horizons (Accessible Travel News) Magazine, Lakehom Magazine, Japanese TELPAL F, a Japanese Travel Show, local FOX TV, local television Promo for Cinderella (Cinderella reading her story in the parlour of the Mandolin Inn), This American Life segment on NPR.